Embattled Venezuelan President Nicolas Maduro pays surprise visit to U.N.
UNITED NATIONS -- Embattled Venezuelan President Nicolas Maduro showed up unexpectedly at the U.N. General Assembly on Wednesday to "defend his country" as six nations accused him of crimes against humanity and President Donald Trump hinted at taking military action. The surprise visit came after Maduro threatened to skip the global gathering, citing fears he could be assassinated as his once-wealthy OPEC nation spirals into a brutal economic crisis and international pressure mounts for the socialist leader to step down. Venezuelan President Maduro declares U.S. diplomat "persona non grata"
"I'm willing to meet with anybody anytime I can (to) save lives, help people," Trump said as he was pummeled by reporters' questions about whether the U.S. would ever intervene militarily to remove Maduro. 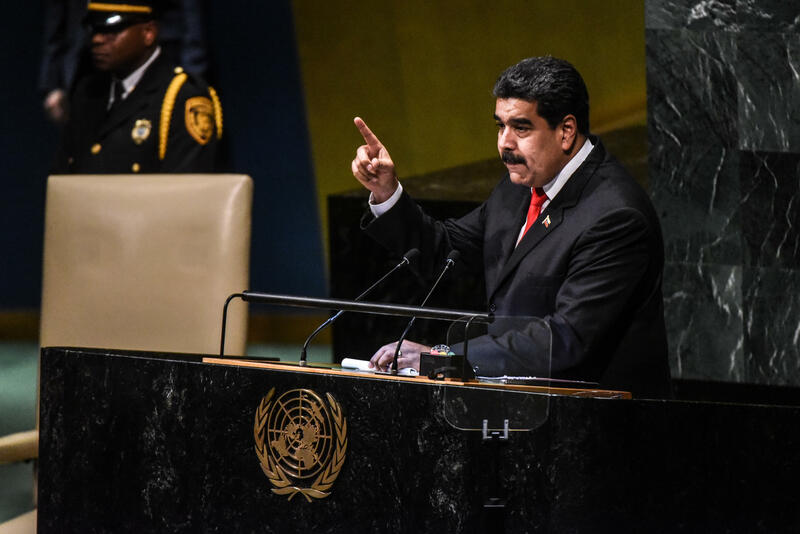 Maduro responded to the comments in kind, saying that he and Trump "certainly have our differences, but that is what we have to dialogue about." Upon arrival, Maduro held meetings with Iranian President Hassan Rohani and Russian Foreign Minister Sergey Lavrov - both of whose countries, like Venezuela, are under U.S. financial sanctions.